Let’s cut to the chase. Watch Sivakasi for the highly enjoyable songs, and you might find a few other little gems along the way. Perarasu (writer/director) has made a movie of two halves that doesn’t quite succeed in being a cohesive entertainment and is a bit too long. But likeable stars, some excellent action scenes, vigorous dances and a commitment to always choosing the silliest solution help the time pass pleasantly enough. 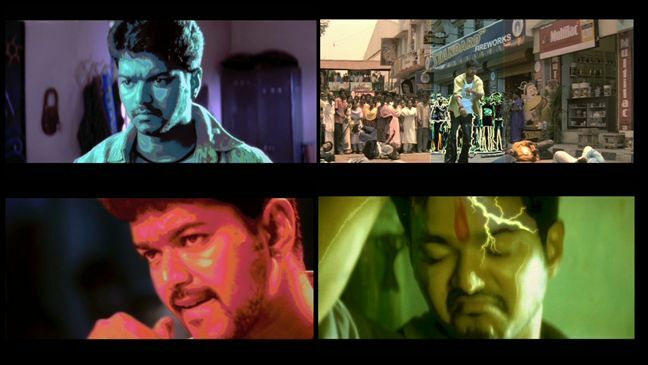 Vijay is the hero, Sivakasi. The police are largely useless against local thugs and he looks after the shop owners and residents of his area. His every gesture is underlined by a sound effect, he wears hideously embellished trousers and his eyes turn red whenever he is enraged. 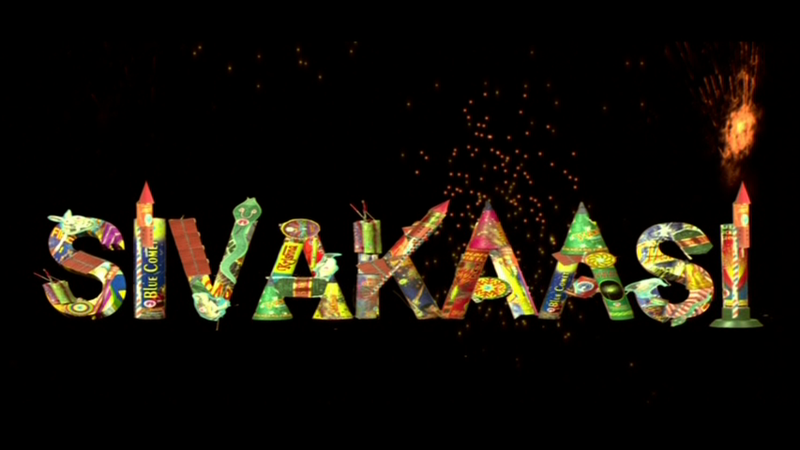 In case that isn’t enough, a colour effect often emphasises the many (bad) moods of Sivakasi. 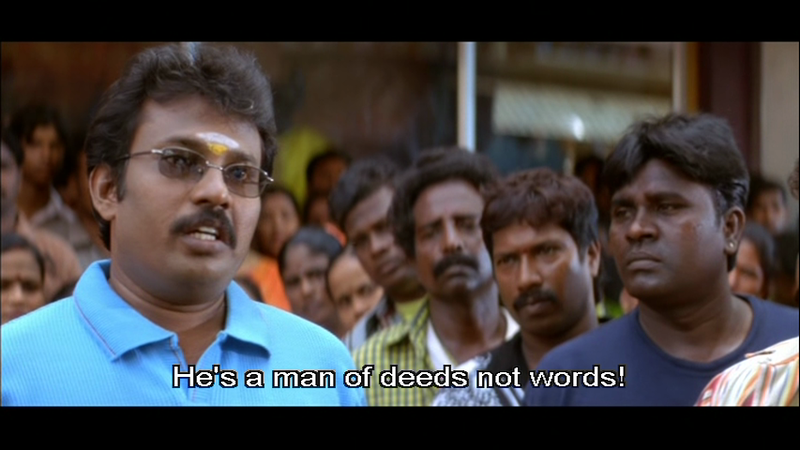 Perarasu also introduces himself by way of introducing Sivakasi, which amused me greatly (as did the spelling). Sivakasi spends a lot of time blow-torching the same piece of perforated metal sheet so I am not sure how successful his business was. I suspect he was on commission at a local glazier as the number of window panes broken in fight scenes was HUGE. The character of Sivakasi is self-righteous and inflexible, and I could understand why he was single and stuck with a comedy gang as his only close friends. Vijay is good as a boyish prankster but once he has to deliver more serious dialogues, he is a bit lightweight and tends to overact in compensation. I can’t help comparing him with the other baby-faced killer in South Indian films and he just doesn’t stack up. But he is brilliant in the physical scenes, whether fights or dancing, and that is where I can more readily understand his star appeal. Asin is Hema, the rich girl who sees no need to feel bad about being rich. She takes on Sivakasi at his own game. It’s a Tamil film with a big name hero so there was no danger of the story being skewed by her perspective but I enjoyed watching her challenge the hero. Sivakasi told Hema off for dressing skanky and western and said if she wore a sari men would treat her like the goddess Laxmi rather than trying to cop a feel. So when she arrives in a sari with a gang of sari-clad aunties and hijras, Hema calls his bluff. Hema is a smart girl with a good heart and a healthy dose of mischief so she is not overwhelmed by the domineering Sivakasi. Asin more or less holds her own in the dancing too, going for maximum energy and not overly concerned with technique. She is a good counter to Vijay in all regards. Her romantic song fantasy puts Vijay in a vintage pink suit so perhaps she has a more vengeful streak than was immediately apparent. I don’t like the female vocals at all in that song (Deepavali), but the dancing is fun. The relationship between Hema and Sivakasi starts as a cartoonish battle of the sexes, with each trying to put the other in their rightful place. It is fun but goes on longer than it needed to. 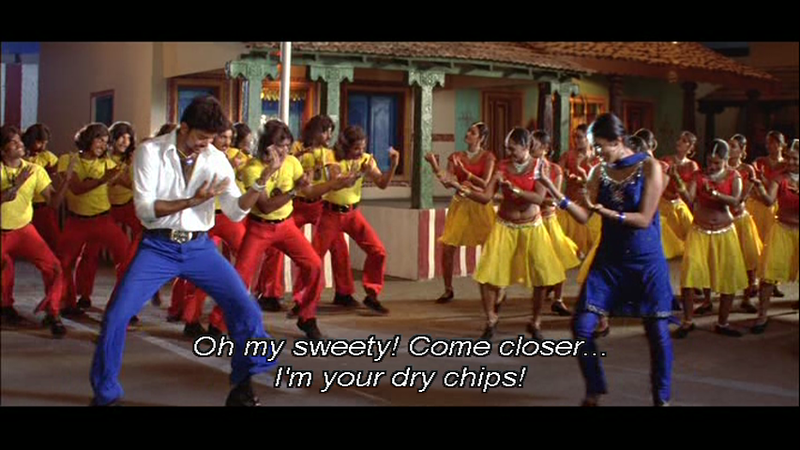 Eventually the two declare their feelings but Sivakasi’s pride and temper keep getting in the way. Finding out he is an orphan, Hema accuses him of not knowing how to be a decent person as orphans can never understand love or affection. He then tells her his tragic backstory. Sivakasi chose his alias based on a horrible incident in his past, but he is really Muthappa, estranged from his well-off family. Hema says she can’t possibly marry someone who would desert his responsibilities over such an issue as it is likely he would do the same to her. She will only accept him if his family come to make an offer, showing that he has mended those fences. And this is where the story takes a turn into flashback and revenge. Rather than just turning up at home, establishing his identity and setting things to rights, Muthappa embarks on a long and complex series of manipulations. It becomes a bit tedious but there are some highlights. Prakash Raj is in good form as evil older brother Udayappa and sports a pleasing array of colourful shiny shirts. He is a local politician/industrialist/landlord/standover merchant. Some of Muthappa’s shenanigans work quite well. Having found a bunch of vintage film star impersonators to support his sister, Muthappa discovers Udayappa has one-upped him and hired Nayantara (as herself) for his rally. She ends up lured into a dance-off with Vijay, which is actually one of his more practical schemes. Muthappa isn’t really that much better a person than Udayappa when you get down to it. He manipulates his sister to ensure her election win – reprehensible behaviour, but it does produce one of my favourite campaign images. There is a large support cast but they made little impression as the action is all about Sivakasi/Muthappa. No one really goes beyond the stereotype of crying Ma, suffering wife, comedy sidekick, bad guy, poor but honest villager etc, so they could have been played by anyone. Lakshana as Muthappa’s sister had the outline of an interesting character as the wronged woman turned politician, but true to the mass hero style everything was handled by her brother. Hema and the Chennai gang turn up to see Muthappa, drawing all the storylines into one place. The stakes escalate as there are abundant hostages for the taking and the unscrupulous methods of both sides come to light. But there is nothing that can’t be fixed with an all in brawl or a group hug. There is little substance to any of the characters or the situations, despite all the dramatics. I found the ending neat but unsatisfying and I think that sums up the movie. The songs (by Srikanth Deva) are what I expected – upbeat, loud, with colourful picturisations and flat-out dancing in exuberant mass filmi style. I must compliment the backing dancers, especially the guys. They are great fun and really enhance the dances with their facial expressions and uninhibited prancing. I particularly like this song, which is Muthappa’s romantic fantasy about Hema and again demonstrates his terrible taste in clothes. Speaking of clothes, when I saw this film something niggled away at my mind. And then it hit me. I know plots and songs get recycled – but costumes? Vijay has at least 2 costumes very similar to those worn by Bunny in and as Bunny in the song Bunny – the red & white ensemble and the silver and yellow number. Surely there are enough costume designers to ensure a rich and varied wardrobe for all? Perarasu also made the dreadful Thirupaachi – I made Heather buy me lunch as compensation for forcing me to watch it – so I had low expectations when I watched Sivakasi and I was pleasantly surprised. Vijay and Asin are likeable and Sivakasi is more light and cartoonish than the usual gloom and nastiness common in Tamil romance films. 3 stars! Heather says: I first saw the opening song for Sivakasi on a bus in Tamil Nadu with the local health workers singing and dancing along which at least partly contributes to why I like this film. Then I bought a song DVD featuring Vijay in that awesome pink suit which was enough of a reason for me to sit down and watch the entire film, even if none of his other outfits in the movie come close to matching it. Sivakasi is a typical mass entertainer to Vijay’s well-tested and regular formula, but since that formula does work well for him it’s worth a watch. The first half really is all about the comedy and is a bit more hit and miss, although I do like the way Hema takes on Sivakasi’s prejudices and at least attempts to stand up for herself before the inevitable declaration of love. When the action takes over in the second half the film gets much better and no-one can beat Prakash Raj when he fully embraces the evil villain character. I also liked Lakshana as Sivakasi’s sister, both for her performance and the rather better than usual way her character is used, and I’m surprised I haven’t seen her in any other films. I do get a little annoyed by the alternate mild violence towards women followed by the worshipping of mothers in this film, but it’s all so cartoonish that a mild irritation is the most I can feel. The dancing is excellent even if sometimes the choreography is less so and the Vijay-Asin combination works well considering they don’t actually spend a lot of time together. Even though every character is painted with very broad strokes it’s still an entertaining film, and definitely better than Thirupaachi (I don’t think I’ll ever be forgiven for that one!). One of Vijay’s better efforts. 3 ½ stars. This entry was posted in Kollywood and tagged Asin, Kollywood, Lakshana, Nayantara, Perarasu, Prakash Raj, Saranya, Sivakasi, Srikanth Deva, Tamil, Vijay. Bookmark the permalink. This movie was perarasu’s last hit thank god!